performing alongside baroque violinist Simon Jones and Soprano Elin Manahan Thomas. many of the colleges there, Including the King’s College Chapel. 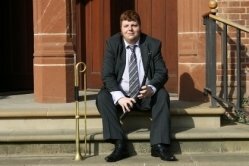 During his time studying, Michael has participated in numerous outreach events across the UK at both Primary and Secondary schools with the aim of encouraging and sparking an interest in brass playing. Michael has been taught by many of leading trumpet players from top orchestras throughout the UK. During his time at the RCS and RWCMD he has become an extremely versatile and adaptable performer and teacher. Michael believes that in order to prepare his pupils for the challenges that lie ahead - Music theory should be taught alongside their instrumental lessons. MichaelFrom Bev (5/5): Michael is a very thorough teacher with a great attention to detail. He is very accommodating and is highly committed to helping my daughter progress.